This post & giveaway is sponsored by CanvasChamp but all opinions are my own. One of my favourite photos of my weirdo kid, who loves brushing his teeth. We moved from Ontario to Nova Scotia at the end of May, and are still settling into the new place. There’s a lot of bare walls, which I’ve been ambitiously plotting decorations for. Between my wild toddler, my businesses, & life, in general, I’ve barely done anything on my house-to-do list! Well, besides hemming all the curtains, which was super boring but necessary. Needless to say, I was pretty excited when CanvasChamp reached out to me about doing a review for them. They advertised dropshipped photo canvases, so I get to scope out if this is something I can add to my shop. Even better, I also get to fill that big boring wall in the bedroom, and offer you guys a sweet giveaway, win-win-win! I’ve carefully cropped out the seven thousand open tabs in my browser, but you can scope out some of my favourite Chrome extension! Ordering my Canvas Print They’ve made the whole ordering process super easy. It requires almost zero technical know-how. You upload your image and it displays a mock up for you. This means you can see instantly what your finished canvas will look like. I wanted to play around with the different pop art options but they weren’t an instant process. 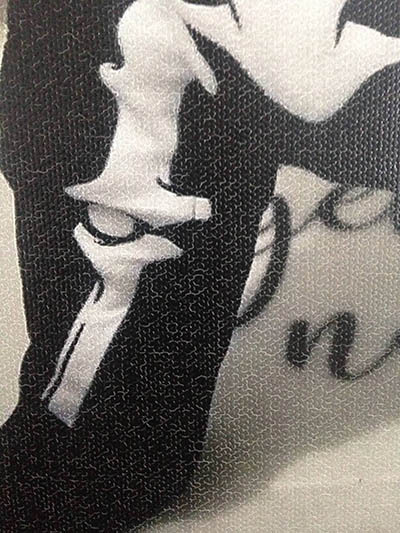 After submitting your photo, their designers edit it, then send you a mock-up for approval. Wrap & hanging options There are endless size options to fit whatever space you’re working with. 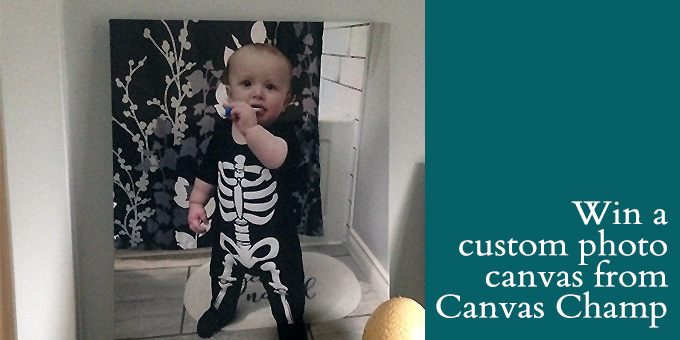 There’s also a variety of wrap options, including thin or thick gallery wrap, rolled canvas or hanging canvas. They offer 10 different frame options, but I like the look of the gallery wrap. Hooks for hanging come included in the price. You can upgrade to a sawtooth hanger, easel back, stand or dust cover back. I have SO much hanging hardware kicking around it’s not even funny, so I’ll take the free hooks. 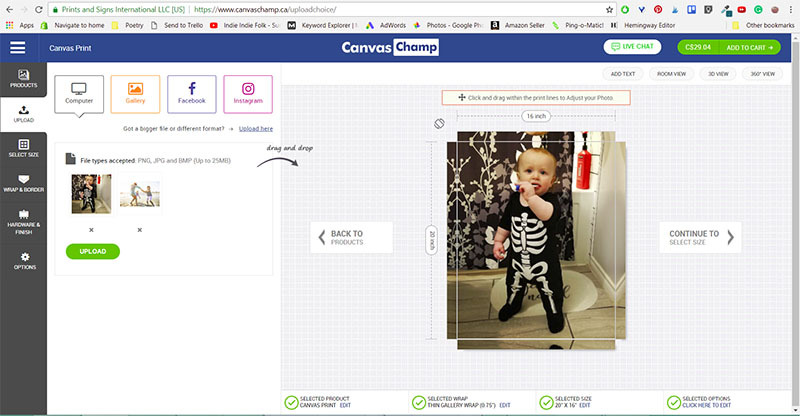 CanvasChamp offers a variety of minor photo retouching options. Small edits, like red-eye removal, date stamp removal, and colour enhancement are $12. Major retouching starts at $25. At checkout, there had a little ‘Drop Ship’ checkbox. I ticked it to see what their white-label packaging looks like. Once you’ve purchased an item from them, you’re auto-enrolled in their referral system. This means you can earn credit towards more prints, plus your friends get a sweet discount (85% off) and free shipping! (Want to take advantage of this deal? click here to use my referral link.) Shipping shock I ordered on the 28th and my canvas was packaged and scanned in for shipping on the 1st. A nice quick turnaround time. But, I was very surprised to see my processed order was being shipped via UPS from India! The company had specifically mentioned in the first email that they’re Ontario-based. My email correspondence had centred around how I love working with Canadian companies. I was a bit miffed. I started researching more. After reading their Google Reviews, it was clear I wasn’t the only one misled by their ‘Canadian company’ statement. Some reviews also mention getting hit with $20+duties and fees since it’s an imported item. After reading through their FAQ, I found it does mentions ‘printing inside and outside of Canada.’ I would say they’re counting on people not reading the fine print on their site. Their policy on customs, duties and fees is directed to international orders. As a ‘Canadian company,’ you would think that doesn’t apply. My package arrived on August 3rd, 5 business days after ordering. Not bad for a package coming from the other side of the world! I wasn’t charged any extra duties or fees, so that seems to be luck of the draw. 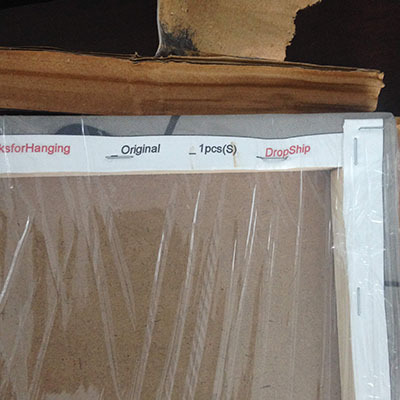 Dropship Mix-Up The canvas print was well packaged, in sturdy cardboard and saran wrap. 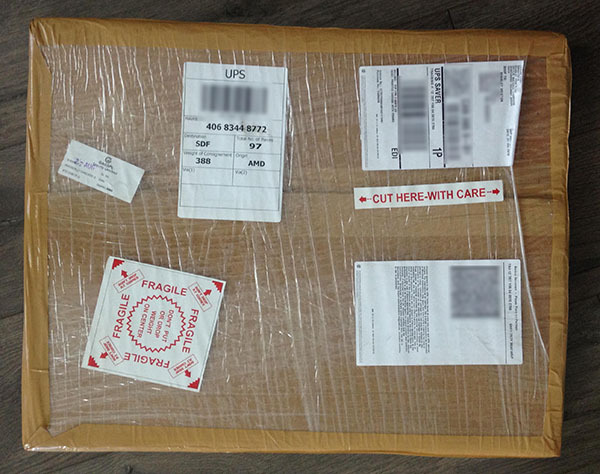 I’d assumed by selecting the dropship package that it would come white-label. Instead, it was marked from Canvas Champ owner, Jainam Shah, and Scarlett Prints. When I opened the cardboard, the first thing I noticed is the word ‘drop ship’ printed on the back of the canvas. Definite fail. Final Impressions The canvas turned out adorable, although the image has a lot of small crackling in it. From a distance, it’s not noticeable. Other printed canvases I own from other companies have a much more solid and smooth finish. My partner loves the print and immediately said we should get another of our kid & pup together (plus an extra one for my parents.) I would definitely give these as a gift, and I know my mom would be thrilled with it, so it’s a mixed bag. CanvasChamp has a 4.5/5 star rating on Google, with 89% of buyers giving them a 4 or 5-star review. They also offer custom photo pillows, photo mugs, canvas banners, custom photo books and more. Unfortunately, the quality is not at a level I would accept if selling prints to customers; I’m not willing to take a chance on them receiving a print with this type of crackling, or being charged duties at delivery. Would you like to check out CanvasChamp for yourself? 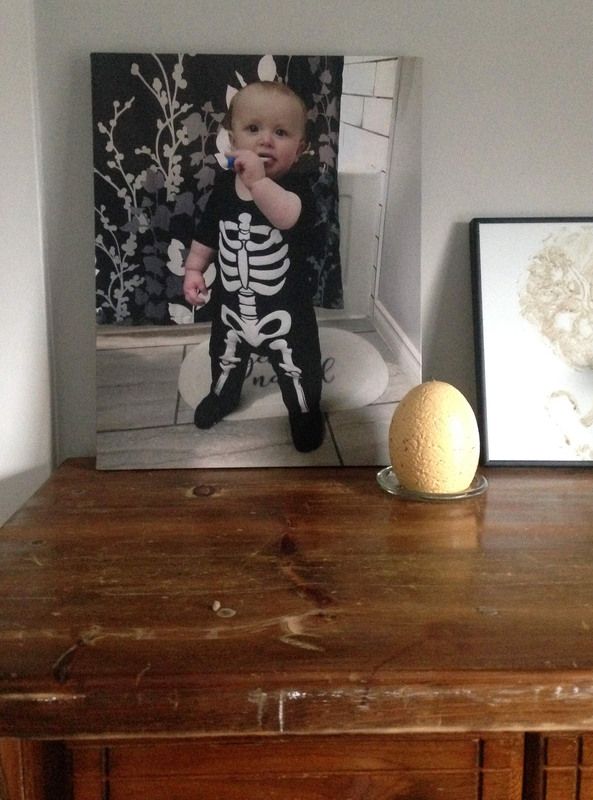 Enter below for your chance to win a 12″ x 8″ custom photo canvas! Contest ends August 15th, 2018 at 9pm ADT.